How do I use SQL-RD to export SSRS reports to dBase format? Export SSRS reports to dBase & automatically deliver them to an FTP site, send them in emails, or deliver them to any number of other destinations. The output format is selected as part of the Destinations setup for each destination type. The tab above can be found in the Destinations section of a schedule. Use this option to select to export all pages or just a selection. 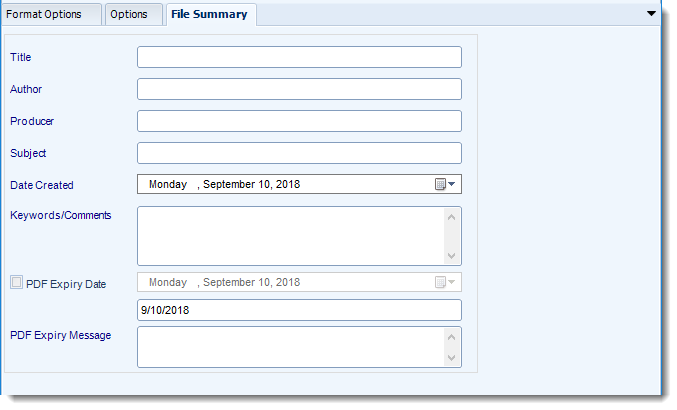 Determine file summary by filling in the required properties as illustrated above. If properties are not filled in or are left blank, the original properties which exist in the exported report will be preserved. To overwrite these with a blank, enter a space in the field you wish to overwrite. This is the option where you named the output file. Compress (ZIP) Output: Zips the output. Ability to use .zip encryption as well. Zip File Encryption: Check the option to encrypt and password protect the zip file. Defer Delivery: The report will be generated at the scheduled time, but will not be delivered to the specified destination until later.